Kansas City police are looking for three people suspected of breaking into approximately 25 cars near Parvin Road and Antioch Road early Friday morning. KANSAS CITY, Mo. — Kansas City police are looking for three people suspected of breaking into approximately 25 cars near Parvin Road and Antioch Road early Friday morning. "It's a tough--hard--pill to swallow," Andrew Gordon, one of the theft victims said. Gordon is out $200 after replacing one of his car windows. "It's another lesson learned—don't leave nothing in the car regardless," Gordon said. Gordon's SUV is one of the vehicle thieves targeted early Friday morning. 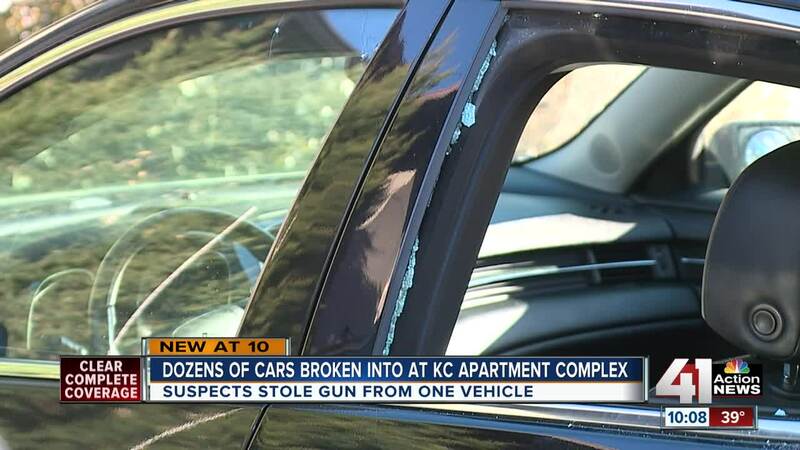 Kansas City police said three men driving a dark-colored Cadillac hit the Briar Hill apartment complex and two others. According to KCPD, many of victims said their cars been rifled through but nothing was taken. However, in Gordon's case, they stole a laptop bag and his wife's handgun. Gordon believes the lack of lights and easy access to the interstate made it easy for the suspects. "People say where you live at, it don't happen. It happens everywhere--there's nowhere safe if you in the north, the south, the east or the west," Gordon said. "It's some bandits wanting to be tough and they won." KCPD knocked on doors in the area looking for witnesses or anyone with surveillance video. Anyone with any information is asked to call the TIPS Hotline at 816-474-8477.